Isak Aghassi was born in 1889 in Baghdad and worked with his father importing dyes and teas from India, eventually focusing on carpets and tobacco. In 1946, Isak put himself, his wife Marcelle, and his two sons Badri and Jacob on a waiting list as prospective immigrants to the United States. He wrote the American Embassy in Baghdad at least once a year (receiving a yearly reply) inquiring when he and his family would be able to leave their dangerous country. The reply was always the same: the quota was over-subscribed and they would need to wait patiently. In … his classic study of the eighteenth-century “Scots-Irish” exodus from Ulster to America, Charles Knowles Bolton cites court records, newspapers, correspondence and other primary sources. 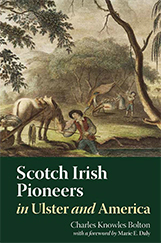 The book provides specific details about immigrant communities in New England, Pennsylvania, and South Carolina, and lists many immigrants and their origins in Ulster. In a time before microfilms, scanned newspapers, and Internet searches, Bolton culled through early American newspapers to locate the arrival of ships from Ireland bearing passengers for New England. He combed state and local archives, viewed correspondence, and reviewed town records to assemble his data. When researching immigration into the United States, especially by the 1900s, one should remember there were laws that had been enacted to prevent immigrants from having been promised a job to entice them to emigrate – contract labor laws. These were designed to protect the immigrants as well as protect those already in the United States from having their jobs given to newly arriving, and probably lower paid, foreign workers. So the idea that there were companies to entice immigrants to come and work [in Canada] was something new to me. The Virtual Museum of Italian Immigration in the Illawarra is devoted to those Italians who came to the Illawarra region outside of Sydney, Australia. Like the Museo [Nazionale Emigrazione Italiana] in Rome, there are many artifacts that you can view in the virtual museum while also looking at and telling stories of Italian families in Australia. Brigham Young University’s Guide to Cuba may be a good start for references to publications and websites related to Cuban research. Also, you may wish to consider Cuban Family History Resources from the Family History Library in Salt Lake City. The Family History Library also has a sizable collection of published references that have not been digitized yet … Any items that have been microfilmed may be rented and viewed at a Family History Center near you … Catalogue items that have not been microfilmed are only available in Salt Lake City. No doubt there will be other posts in coming months on topics in international genealogical research, so be sure to check back often! The rest of this article on the Arab family trying to emigrate to the U.S. is missing!! Susanna, The links to the original blog posts are in orange type – I think, in this case, they all precede the excerpted text.